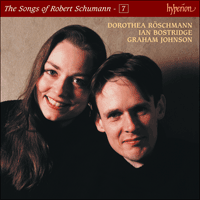 That Robert Schumann expanded the horizons of the lied is without question; it is this, after all, which marks him out as the natural successor to Franz Schubert. One of the areas in which he made real innovations is in that enchanting sub-section of the genre, the vocal duet. In welcoming the dramatic implications of a text shared between two singers (while avoiding the operatic exaggerations which might overwhelm intimacy and delicacy) he gave this form a new life with music both exciting and touching. In Volume 6 of this series we have already examined Schumann’s virtual invention of the song-cycle for four voices (SATB) – a form which enabled the composer to mix solos and duets with quartets. This development dates from 1849 (as do the Op 78 duets which end this disc), but Schumann’s interest in combining the male and the female voice in the important duets of Op 34 is one of the many exciting aspects of that great song year, 1840. When one looks at the work list of Franz Schubert one searches in vain for a sumptuous array of piano-accompanied songs for two voices. In fact, outside the relatively unknown operas, there are only two real Schubert duets, that is to say works where two voices combine (as opposed to sharing a text in narrative fashion): Licht und Liebe (Matthäus von Collin) and Mignon und der Harfner (Goethe). In both cases the composer was clearly inspired by the authors’ own specific instructions. In Act IV Scene 2 of his play Friedrich der Streitbare Collin calls for the distant sound of a male voice, then a female voice, and finally the two voices combined; Schubert’s gently melodious composition complies exactly with this specification. In Book 2 Chapter 11 of Wilhelm Meisters Lehrjahre Goethe refers to an ‘irregular duet’ between those unhappy characters Mignon and the Harper, and once again Schubert obliges – although it is worth noting that of his six settings of this lyric (the celebrated Nur wer die Sehnsucht kennt) this is the only duet. This does indicate, however, that the composer was always aware of the broader literary picture when it came to poems which were excerpted from larger works. Schumann’s sensitivity to, and interest in, this form is not hard to understand: the defining struggle of his life was the winning of his bride, and the earlier part of his own biography is a testament to the inspiration of a happy marriage and harmonious family life. Even if his Op 34 duets were written before his marriage the very sound of this music betokens the domesticity of the marital state. Like so many other Schumann songs of 1840 the music describes projected happiness rather than the experience of it – the musical spell seems consciously woven in advance, as if one of the duets’ functions was to help to turn into reality the togetherness implied by the close interactions of the music. Another Lieder composer who was happily married (since 1837, a few years after he had moved to Leipzig as Generalmusikdirektor) was Felix Mendelssohn. His winning of a pretty young wife, Cécile Jeanrenaud, might even have further steeled Schumann’s determination to marry his Clara. It is almost certainly thanks to Mendelssohn’s example that by 1840 Schumann was no longer a piano-fixated composer who disdained the task of setting words to music. (There is some evidence that this was still the case as late as 1838.) By temperament and talent, and also in terms of his literary upbringing, Schumann was even more suited to song composition than Mendelssohn, but it took the more celebrated man’s example to show Schumann the way. One can imagine an evening of music-making in Leipzig sometime in late 1839 when Schumann heard Mendelssohn accompany some of his songs (probably for the umpteenth time) and thought: ‘I can compose lieder like that, just as well … and perhaps better.’ His love for Clara, and his need to find a new means of expressing it, was the catalyst that spurred him to action. Although he was only one year older than Schumann, Mendelssohn had long had a place in Schumann’s pantheon as an admired and senior figure; this was the artificially created gap between the precociously early developer (Mendelssohn had had a musical career from the age of ten or eleven) and Schumann the late starter. The universal success of Mendelssohn’s compositions was unarguable, and his high profile as a performer, conductor and musical personality was complemented by a genial personality. He had many of the things Schumann lacked: financial means, a musical grounding that went back to his infancy, outgoing charm and savoir faire, the urbanity that comes with constant travelling since childhood, international connections; in short, he was a glamorous figure with the Midas touch. Clara Schumann acknowledged his pianistic prowess time and again in her diaries, but seemed unsure as to whether Mendelssohn truly admired hers. (Could this have been a cause of the friction described later in this article?) By 1840, aged only 31, he had already composed more than half his song output (much of it unpublished; he had been a prolific song composer since his teens) and he had already composed a few simple but charming duets for two female voices. I am certain that these were of crucial importance to Schumann. The composer waited on tenterhooks for Clara Wieck to turn twenty-one in September 1840; this was the month in which the law would allow them to marry at last. The solo lied was a field which perfectly fitted Schumann’s new expansively romantic mood which was both joyous and tense – having won his bride’s heart it was as if he still felt that he might lose her at the last moment unless musical spells were continually conjured to keep evil spirits at bay – vocal incantations as it were. From the point of view of his own amour propre this was a field he could ‘take over’ from Mendelssohn, bringing to the song form his own awareness of Schubert’s achievements, and a passion for, and knowledge of, contemporary poetry. (A quarter of a century earlier Schubert had noticed that, in Beethoven’s shadow, there was more room for him, the younger man, to make a new contribution in this field than in any other.) Mendelssohn had inherited the mantle of the Berlin lied tradition of Johann Friedrich Reichardt via his teacher Carl Friedrich Zelter; as a fellow-German (though Saxon-born, rather than Prussian) Schumann was attracted by the directness of this style which included a propensity for fast songs cast as bracing instrumental-style scherzi. But he was also aware that in Vienna Schubert (and Beethoven in An die ferne Geliebte) had achieved something deeper and more daring in setting words to music than had been dreamed of by the Berlin pioneers. It was to be Schumann’s destiny to gather together both strands of Lieder history, the German and the Austrian, and to make his own daring synthesis. There was a prim and Prussian side to Mendelssohn which seems not to have heard much in Schubert’s songs to admire. He never wrote approvingly about Schumann’s music either, though he often voiced his praise according to Schubring who knew him well. On one occasion in October 1842 he praised Schumann after a performance of his three string quartets (approbation from the ‘highest critic’ as Schumann proudly recorded) but a contemporary letter shows that Mendelssohn thought highly only of the first of them. The ‘lean and clean’ side of Mendelssohn’s nature would also have found the Schubert Lieder too discursive, too harmonically indulgent, often too long. He might have shared Goethe’s belief that it was presumptuous of a composer to upstage a text with music that aimed for a sublimity which could only be pretentious within the boundaries of a mere song. Schumann was a ‘modern’ and certainly not old-fashioned enough to subscribe to this view, but it is significant that he seldom allowed himself to write long songs; on the contrary, his gift was for the fragment and the epigram. No one could ever accuse his Lieder of rambling in a Schubertian manner (this is just as well, as only Schubert can ramble and get away with it successfully), and it is here that Schumann owed much to the concision of Mendelssohn’s song style. The German word schlicht (‘simple’, with connotations of ‘smooth’ and ‘straightforward’ rather than ‘easy’) seems descriptive of much of Mendelssohn’s music, and the composer would have been proud of the craft and skill which avoided high-flown muddle. Schumann must also have noted that Mendelssohn’s own virtuoso pianism was, with some exceptions, moderated to much greater simplicity in his song accompaniments; indeed, one may conjecture that the scale of Schumann’s own trimmed-down accompaniments (that is in comparison to his solo works for the piano) owed much to the controlled flow of the first set of Mendelssohn’s Lieder ohne Worte – the ‘Songs without Words’ – which was published in 1837 and where sheer melody is given prominence over piano writing which is showy for its own sake. Add to this Mendelssohn’s zeal for Bach (which was transmitted to the Schumanns who spent the early months of their marriage studying Bach’s 48 Preludes and Fugues together) and we begin to understand how the early music traditions of eighteenth-century Leipzig also make appearances from time to time in Schumann’s vocal works (this is also discussed in Volume 6). As in any two such contemporaries constantly listening to each others’ music (Haydn-Mozart, Debussy-Ravel, Britten-Tippett) it becomes difficult to unravel who owes what to whom. Mendelssohn had set both Heine and Eichendorff before Schumann did so, but it is clear that he saw these poets in a new light after hearing both Liederkreis cycles and Dichterliebe. Mendelssohn’s more interesting and elaborate duets were also written some years after Schumann’s Op 34 set. There were some poets like Lenau and Hoffmann von Fallersleben which Schumann might have encountered as lieder poets via Mendelssohn, but he seems to have been indifferent to such writers as the old-fashioned Johann Heinrich Voss (a Mendelssohn favourite), Ludwig Tieck and by the various poets (Karl Klingemann for example) whose connection with Mendelssohn was purely personal. On the other hand it seems likely that Mendelssohn’s Venezianisches Gondellied was almost certainly the result of his encountering that text in Schumann’s Myrten. It is perhaps significant that an important song-composing year for Mendelssohn was 1841, immediately after Schumann’s annus mirabilis of 1840, and once again in 1847 when Schumann was little engaged in lieder. Perhaps this is only coincidence. But it was only in 1849, two years after Mendelssohn’s death, that Schumann felt able to write a large vocal work associated with Goethe’s Wilhelm Meister, and with Faust. As a boy, Mendelssohn had been Goethe’s cherished and adored favourite, and it is likely that Schumann felt disinclined to encroach on territory where his colleague had such a formidable personal connection. This imperceptible jostling, privately wary and officially admiring, suggests a friendship complicated by unspoken rivalries and genuinely differing artistic viewpoints. This is a familiar enough scenario between contemporary composers – the genuine intellectual support of a Goethe for a Schiller, and vice versa, was exceedingly rare. It was Schumann’s nature to be generous to his colleagues; it was Mendelssohn’s to be more reserved and infinitely more politically canny. The low point in the relationship was in November 1840 when the newly-married Robert and Clara discussed via their diary an issue of which, it seems, they could scarcely bring themselves to speak. We shall never know what incident sparked Schumann’s totally private observation in connection with Mendelssohn that ‘Jews remain Jews’ who are always ‘putting themselves first’. Mendelssohn was capable of being patronising and his position in Leipzig engendered servile and flattering behaviour; Robert and Clara resolved no longer to belong to this tribe of worshippers, to distance themselves from the ‘court’. Schumann felt that he had done more than anyone else as a journalist and critic to fight Mendelssohn’s cause, and he felt slighted in some way where jealousy too must have played its part: Mendelssohn could not help but be Robert’s rival as a composer, and Clara’s as a pianist. This diary entry is hardly the worst that Mendelssohn encountered in his homeland – and of course he never knew of this particular observation. But it is one of several pieces of evidence that explains why the Jewish composer felt that he remained, in the final analysis, an outsider in Leipzig and Berlin, whether or not he had been baptised. In this context his attachment to England, which he felt to be a more tolerant country, makes poignant sense. Schumann was far from blameless in this regard, but it would be nonsense to mark him down as a vicious or consistent anti-semite; on the contrary he was more openly, and publicly, on Mendelssohn’s side than almost anyone else in Germany. (His, and Clara’s, later comments on that well-known Christian, Franz Liszt, were far more hurtful and vituperative.) Schumann’s outpouring of affection and regard on Mendelssohn’s death in 1847 was completely genuine, and this is surely because he owed so much to his prematurely deceased colleague, after whom the last of Schumann’s children, Felix, was named. It was Mendelssohn’s successful example which gave him something to strive for and which showed him that he must aim for a richer musical life than that of a journalist and pianist in love with another pianist – Clara his muse. If Mendelssohn had not been in Leipzig in that period, and if his concerts at the Gewandhaus (and in his own home) had not included chamber music, lieder and even duets, as well as symphonies, it is possible that the range of Schumann’s output might have resembled that of Chopin. To have the opportunity of being even in moderately close touch with a man of such wide culture, with such a breadth of musical sympathies, must have been deeply inspiring for Schumann as well as an occasional source of envy. And we sense that he set his cap at matching Mendelssohn’s achievement in almost a systematic manner – 1840, the Lied; 1841, the symphony; 1842, chamber music (his three string quartets are dedicated to Mendelssohn). Schumann also later composed oratorios of a kind, but not to the religious subjects that Mendelssohn had embraced. Some of his Mendelssohn-matching exploits (such as in turning his hand to conducting) were less well advised. Most people would admit to having in their careers a person who is a ‘marker’ by whose comparative success or failure they secretly measure their own progress and aspirations. It seem to me that Mendelssohn was Schumann’s ‘marker’. In the beginning of his career (say in 1835 when Mendelssohn first arrived in Leipzig) this might have seemed an impossibly ambitious viewpoint, but as time went on and Schumann’s stature grew, the two composers became increasingly equal in renown while simultaneously growing musically apart. The surviving letters that Schumann wrote Mendelssohn in 1845 are cheery in tone (‘Lieber Mendelssohn’ – the polite ‘Sie’ form rather than the familiar ‘Du’ – but nevertheless warm). This is the exchange of equals, and completely lacking that sense of awe and reverence with which Robert and Clara seem to have treated the great man up to 1840. And in Schumann’s music we can detect here and there a sound that seems particularly Mendelssohnian, that side of Schumann which seems comfortable and genial and ‘at home’. He was after all, like Mendelssohn, a composer of the Vormärz or, in English terms, an early Victorian. And where does this seem especially evident? In the sound of two voices entwined and singing tenderly together, heart to heart, with an accompaniment lovingly played by a modestly gifted pianist. Admittedly the Op 34 duets with which this disc opens are sometimes more challenging than this, but time and again Schumann delights in returning us to a domestic cocoon, and nothing suits this mood better than the vocal ensemble in its various manifestations.